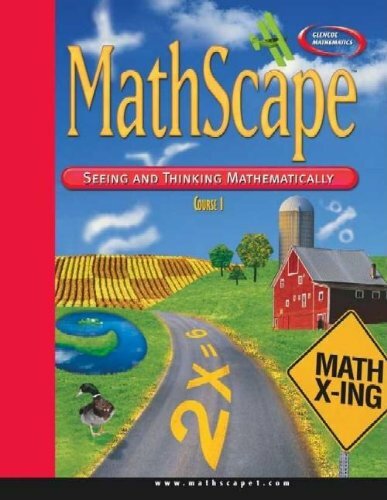 [PDF] MathScape: Seeing and Thinking Mathematically, Course 1, Consolidated Student Guide (CREATIVE PUB: MATHSCAPE) | Free eBooks Download - EBOOKEE! Description: How well do you know your class? Taking a survey is one way to get information about a group of people. You and your classmates will answer some survey questions. Then you will graph the class data and analyze it. You may be surprised by what you find out about your class. MathScapeTM: Seeing and Thinking Mathematically is a standards-based program that encourages your students to learn mathematics by doing mathematics, by using and connecting mathematical ideas, and by actively increasing their understanding. MathScape is one of four middle school programs to receive a satisfactory rating from the American Association for the Advancement of Science (AAAS). No comments for "[PDF] MathScape: Seeing and Thinking Mathematically, Course 1, Consolidated Student Guide (CREATIVE PUB: MATHSCAPE)".